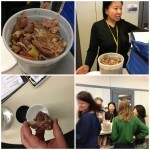 We scored some leftover raccoon from WBEZ “Moveable Feast” blogger Louisa Chu. She brought us some delightful leftovers here in the WBEZ CityRoom. Check out her assessment of the 86th Annual Raccoon Dinner. The tiny ribcages might have disturbed one or more WBEZ staffers. I’ve had possum before. First time trying raccoon. Tasted like corned beef.